We know that you have a choice when it comes to selling your excess golf inventory or utilizing a trade-in program. We are confident that our services will exceed your expectations. When you partner with Swing'em Again Golf, you can feel assured that we are committed in providing you with the highest level of customer service. 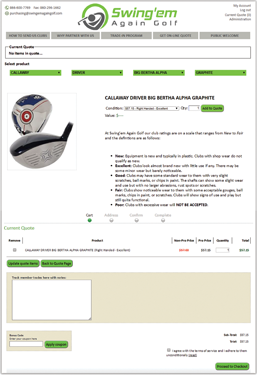 CLICK HERE to use our online quote engine to view pricing for your golf clubs. Then simply continue the process and submit your order. You will be able to print our prepaid UPS labels from your computer to ship us your inventory. All approved golf shop partners are prepaid for their online quote submissions and are offered FREE shipping! We confirm all transactions and keep you updated along the way. Many competing Club Value Guides have major swings in pricing based on the time of the year. Our Value Guide remains consistent and is the most extensive in the industry. We purchase most brands in the market. SELL US YOUR EXCESS INVENTORY! WE BUY IT ALL! We pay top dollar and accept nearly every brand of golf clubs, bags, shafts, heads, grips, clothing, balls, carts, gloves, shoes, hats, headcovers, fitting cart components and much more! WE PROVIDE YOU WITH FREE TOOLS! We can help you promote a TRADE-IN PROGRAM which is supported with our FREE marketing kit. CLICK HERE to download digital signs and mailers directly from your computer. Our partners also receive banners and suggestions to make their Trade-in Program a success! Have you considered taking in Trade-ins toward lessons, other products and member amenities? Simply send us the clubs, receive payment while increasing multiple sales. It's a win, win! Same day quotes on anything in your golf shop. We buy unlimited quantities at premium prices. You are pre-paid with a check or through paypal. FREE Shipping and NO hidden fees.